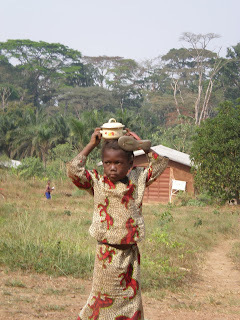 A young girl taking home food to share! Just a few of our 900 kids - a lot of mouths to feed! You can never have too much rice. In January Andando made a trip to Africa to our sponsored feeding program. It's in Buedu, Sierra Leone and it's not an easy place to get to. 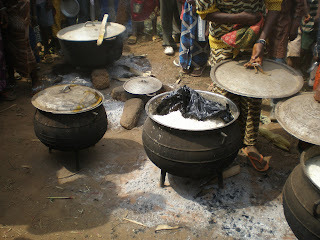 It is located in a remote corner of Sierra Leone near where the Liberia, Guinea, Sierra Leone borders come together. On previous trips we had traveled through Sierra Leone to get there.- on very bad, almost impassable roads. This time we thought we’d try a different route going through Liberia. Well it turns out the roads were only slightly better. It took about 15 hours to get to Buedu from Monrovia, about half on dirt roads. Fortunately it was the dry season . During the rainy season, May to September, this road would be impassable. We were greeted in Buedu by what seemed like a million children and definitely more than the 600 we thought we were feeding! We estimated it’s closer to 900 kids in the program, but the folks there are doing an amazing job. They are feeding these kids five days a week, cooking on open fire. Two hard working women (volunteer positions) do most of the cooking. We had some great discussions about the program and ways to improve it. Since our last visit to Buedu, many people have started farming again since peace has returned to the region, so there is more food available locally. We discussed the availability of local rice. In the past we had to ship rice there which added to the cost. We've changed that. Now the feeding program is going to start using local rice, which is more nutritious because it is not processed. This will also help the local economy. Another way we are able to help the local economy is by buying bread once a week from a local baker and using bread instead of rice. We were also able to bring school supplies and medicine for the kids. It was a really encouraging and worthwhile trip. Thanks so much to our amazing partner there, Saah Joseph. Several years ago Saah shared this need with us and he has been faithful to continue working with Andando, again as a volunteer. 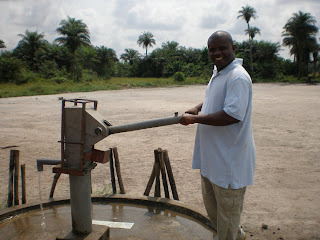 Without his commitment and vision the feeding program would not be possible. On the same trip we made a quick stop in Senegal to visit with our micro loan partner there, Diegane Ndiaye (another amazing Andando volunteer). Once again, without our in-country partner, our program just would not work. Diegane has administered our micro loan program for a year now and we have seen an almost 100% return on our loans thanks to his diligence and faithfulness. He is now in the midst of making this years’ round of loans with the the previous years money being recycled again into the community - and the new money from your generous gifts being added to it. 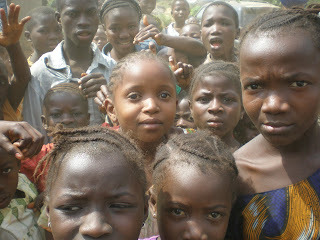 You can be a part in bringing hope and dignity to these wonderful people in Senegal and Sierra Leone. Join us if you can, and thanks to those of you who already have!